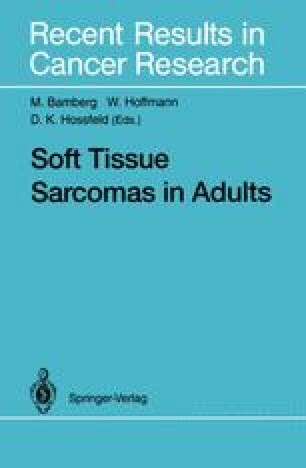 In contrast to the numerous reports about combined modality of irradiation and local resection, there is only sparse information on the efficacy of radiation therapy alone in soft tissue sarcomas. Local control represents the “curative” aim of radical surgery and function-sparing local excision followed by intensive radiotherapy depending on size, localization, and grading of the tumor. In inoperable disease irradiation as radical treatment seems to be unrealistic, because the goals of treatment to render the patient free of tumor and to produce no morbidity can hardly be achieved (Bamberg et al. 1989; Fig. 1).